Quality Seafood has been operating for over 40 years, producing a variety of blue crab products including crab meat, live crabs, steamed crabs and soft shell crabs. Delivery transportation is provided by our own company trucks throughout the southeast United States. For customers in the northeast and midwest we ship five days a week through freight carriers that specialize in shipping seafood, guaranteeing our products are received as fresh and as fast as possible. Jumbo Lump - These very large pieces of white meat come from the body of the crab. It is especially good for recipes where appearance is important, such as hors d'oeuvres and salads. Backfin - The backfin area of the crab also produces solid lumps of white meat. These smaller lumps, some of them broken, are just as good for most recipes. Special - This category refers to all the small pieces of white meat from the rest of the crab's body. It is most commonly used for crab cakes, soup, dips or casseroles. Claw Meat - Meat that is taken from the claws, which in many crabs has a brownish color. Because of the coloring, it is not used in recipes where appearance is important. 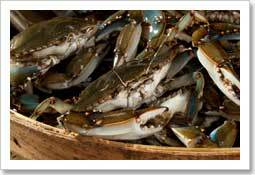 Quality Crab Company, Inc. only processes the American Blue Crab (Callinectes Sapidus). 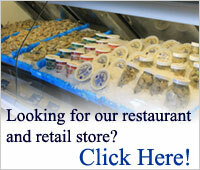 North Carolina has a supply of blue crabs all year long with the peak months of production being April thru December. Crabs are caught in crab pots made of wire mesh. Menhaden fish is usually the bait of choice. Once delivered to the processing plant, live blue crabs are inspected for physical damage, mortality and for foreign material. At this point only the blue crabs that pass inspection are further processed. Once the crabs are placed into stainless cooking crates, the crabs are steamed under pressure from 8 to 16 minutes at 240 degrees F. Crabs are then moved to the air cool room to let the steam dissipate. Once visual steam is no longer present, the crabs are moved into the holding cooler until processed. Picking the crabs is performed by hand. All crabmeat is hand-picked. Before the pickers can weigh in they are required to inspect the crabmeat for shells and foreign material. After the crabmeat is cleaned, they bring their crabmeat to another weigh in/inspection station. Once received in the weigh in station, the crabmeat is inspected a second time for shell, foreign material and quality. Quality Crab samples meat at this step in the production to ensure the crabmeat meets quality specification and is suitable to package for pasteurization. Packaged crabmeat is then loaded into stainless steel baskets for pasteurizing. Pasteurizing consist of placing the cooking basket into a 180 degree F water bath for 2 hours and 20 minutes, then placed into an ice/water bath for approximately 1 hour and 45 minutes. The product is then removed from the chill tank and placed into the finished product cooler. After pasteurization, a final sample is pulled to verify the product meets customer specifications. All crabmeat is USDC inspected. At Quality Seafood our mission is to guarantee that all of our crab meat is harvested from sustainable marine habitats. This practice helps ensure that North Carolina's marine wildlife and fisheries are protected for future generations. Read more about our sustainability practices here.